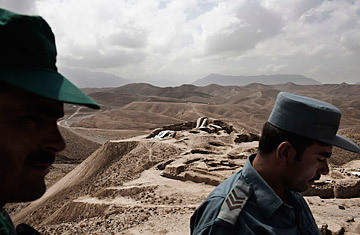 Members of the fledgling Afghan national police guard a provincial archaeological site. Out at the Kabul military training Center, on a barren hilltop, Colonel Fazl Karim is giving a new batch of recruits his usual pep talk. It's two weeks before these soldiers are commissioned as regulars in the Afghan National Army, and in some ways they look ready to go: they sit cross-legged in the dirt, all aligned in neat rows. Construction crews build more barracks nearby; 100,000 more recruits are expected to go through the U.S.-built training center in the next three years. If everything goes as planned, some 352,000 men will be ready to defend this country the day the mostly American army of foreign fighters packs up and leaves. "You are all going to die one day!" shouts Karim. "You might as well die protecting your country!" A few men stifle yawns. Others poke their snoozing companions awake. Even the American officers overseeing all the training are skeptical. Taliban infiltration, drug use and desertion are commonplace among the men who arrive here. Troop quality is poor; recruiters can't be too selective when they have such large quotas to fill. For U.S. Army Captain Jason Reed, who is part of the training mission, it's just a matter of time. A long time. "As long as training continues when we leave, there is no reason to think that Afghanistan can't continue to grow a professional army," he says. "But it's going to take generations." The government of Afghanistan and its American patrons do not have generations to make the country work. Afghans are supposed to take responsibility for their own security on Dec. 31, 2014, 38 months from now. But 10 years after the U.S. invaded this long-suffering country and then settled in for a long occupation, Afghanistan is nowhere close to being able to stand on its own  militarily, economically or even politically. To many, it has become an expensive misadventure. Meanwhile, the U.S. keeps broadcasting its intention to leave, not so much withdrawing as recoiling from a problem it seemingly no longer has the will or the ability to solve. The prospect is frightening: Afghanistan today has the potential to be even more destabilizing for the region and the world than it was under the Taliban. Lawlessness has become the rule, so much so that many Afghans have grown nostalgic for the cold but effective dicta of Mullah Mohammed Omar's theocracy. Osama bin Laden may be dead and his fraying al-Qaeda network dispersed to other lands, but when the Americans leave, the country could easily revert to the failed narcostate and terrorist training ground that it once was. That alone would be a potent propaganda victory for America's foes. And it would risk unleashing another proxy war as rival militias, backed by regional allies, re-enact the civil war that saw the rise of the Taliban in the first place. Such a conflagration could pull nuclear-armed rivals Pakistan and India to the brink. American patience for an alternative scenario is nearly tapped out. Over the course of 10 years, the U.S. has lost 1,786 service members and 763 private contractors there. An additional 14,342 service members have been wounded. The U.S. established over 180 forward operating bases around the country, deployed more than 9,000 mine-resistant vehicles and spent a total of $444 billion in the past decade on securing and rebuilding the nation  and attending to the damage the war caused to its troops when they returned home. America's best strategists and military minds and nation builders and engineers were set to work on one of the largest country-building efforts since the Marshall Plan. And it simply hasn't worked. Even now, 10 years after the 2001 invasion, security is at one of its low points. The U.S. embassy in Kabul suffered through a prolonged siege last month. High-profile assassinations have picked off the top tier of government and security officers, including a former President tasked with leading peace negotiations with the Taliban leadership. Even as NATO statistics point to a 2% reduction in enemy attacks, the U.N. holds that 2011 is on track to be the most violent since the invasion for Afghan civilians. American officials, first in the George W. Bush era and now under Barack Obama, confidently maintain that economic and security conditions in the country are improving, little by little. But the evidence for that claim is scant, and the deadline for U.S. withdrawal gets closer each day. In many ways, the withdrawal has already begun. I first went to Afghanistan for TIME in the winter of 2003. I expected resentment, poverty and destruction. Instead I encountered an extraordinary sense of hope. I ate greasy stews with tribal elders who were anticipating roads that would connect their villages, for the first time, to civilization. I went to school with teenage girls who sat alongside 6-year-olds to get the first-grade education denied to them by the Taliban. I shared the country's dangers too: I was nearly blown up by a suicide bomber and was ambushed alongside U.S. troops near what we had thought was a friendly village. I once had my life threatened with a hurled teapot. But still I kept going back for the fix. Like all of Afghanistan, I was hooked on hope. A few years later I moved to Kabul, where I met, and married, an Afghan American who had returned after two decades in exile because he too believed in the country's future. We had a daughter, and when she was 2 months old I got her an Afghan passport, determined that she would one day play a part in a resurrected Afghanistan. These days, I am starting to think that the flimsy blue booklet, embossed with the Afghan state seal, will be little more than a souvenir of an infancy spent in a collapsed country known best for drugs, terrorism and its endless history of war  a country that may become a footnote in America's noble but sometimes foolhardy habit of trying to do good miles from home. When the U.S. invaded Afghanistan on Oct. 7, 2001, it was not just to avenge the terrorist attacks of Sept. 11; it was with, in the words of then President Bush, a moral obligation to "disrupt the use of Afghanistan as a terrorist base of operations." Bush also promised to raise the hopes of the "oppressed people of Afghanistan." The U.S. toppled the Taliban with little more than a few hundred Special Forces on horseback and satchels full of cash, showing  or so Washington thought  that the model of a light-footprint war could reverse a millennium of imperial routs in a country known as the graveyard of empires. That proved premature. The enemy the U.S. thought it had defeated simply melted into the population, while its leadership plotted a return from safe havens across the border in Pakistan. Distracted by Iraq and other crises, America's attention-deficit disorder toward Afghanistan undermined those early gains. The Taliban slipped back in, laying the groundwork for a tenacious insurgency that, several years on, even a threefold surge by U.S. forces has not been able to defeat. See pictures of battle in Kandahar.